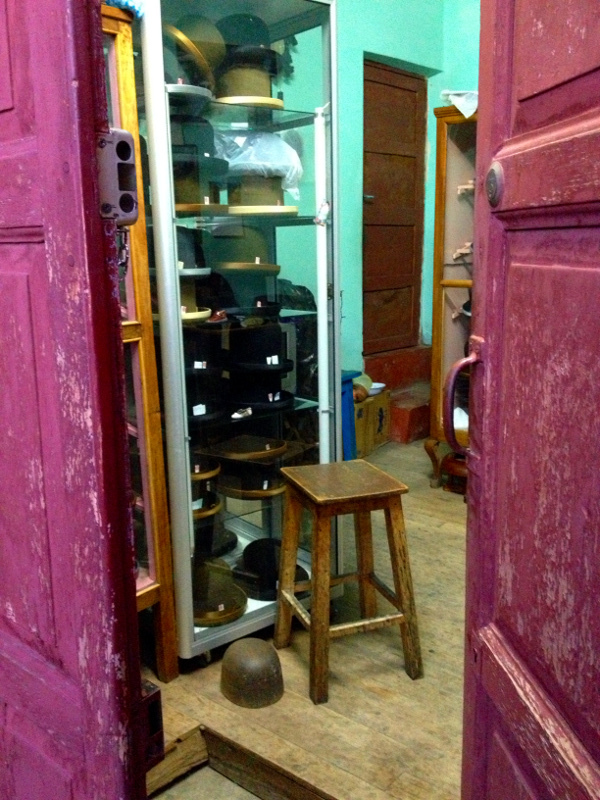 Other travelers spoke very poorly of Puno, so we had a negative bias before even arriving. The moment we set foot in the bus terminal, we were being hustled to buy a ticket to Copacabana, Bolivia for 7AM the next morning. 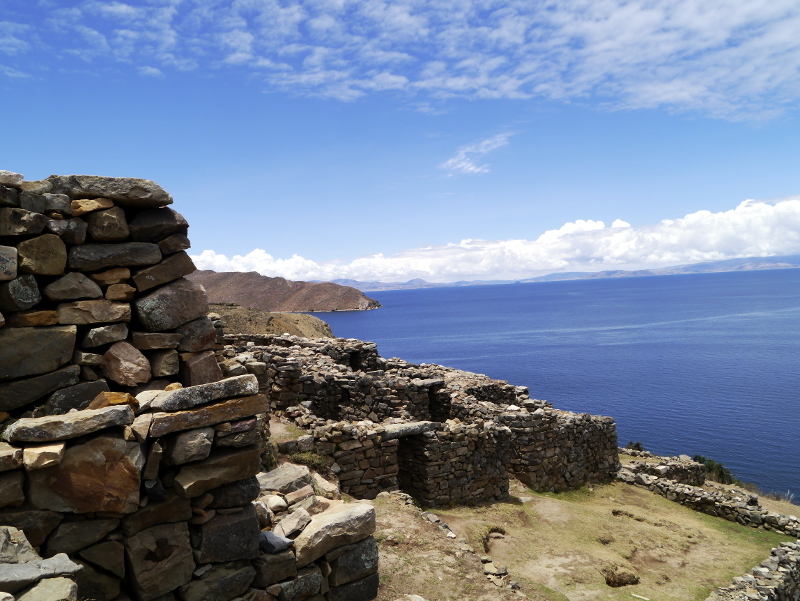 I just couldn’t do it – we had woken up before 6AM the past 4 days and even though everyone said Puno was not worth any time, I needed to have a relaxing day where I could sleep in. 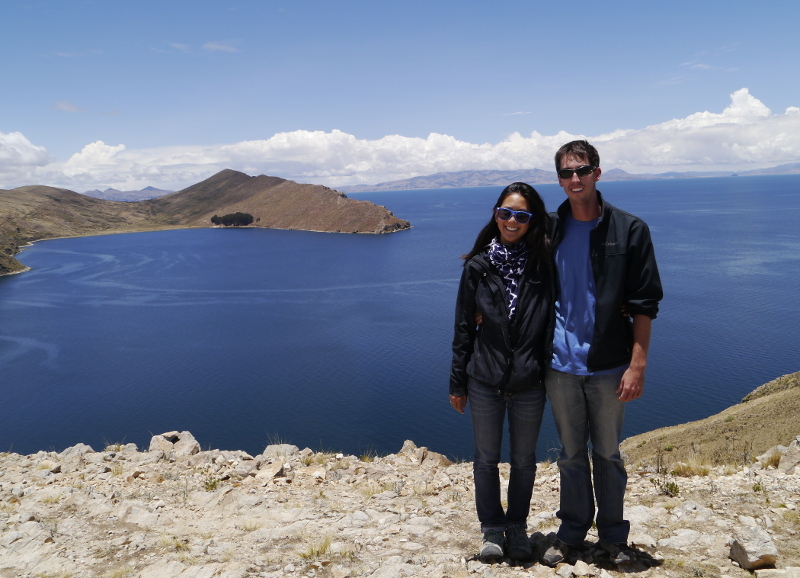 Was the shore along Lake Titicaca among the most polluted I have ever seen? Yes. The carpet of algae was so thick that it looked like you could walk across. I would not recommend a walk along the lake because it smells so strongly of sewage. This was the famed Lake Titicaca?! (Don’t worry, it gets better). BUT we did stay at a hostel (Duque Inn) with an amazing view. That night we had dessert on the rooftop enjoyed a wildfire on the hill to the left and a lightning storm over the lake on our right. 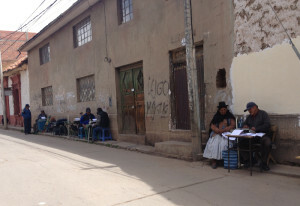 We had a slow morning before boarding an afternoon bus to cross the Peru-Bolivian border. The bus was packed back-to-knee with tourists looking for a fast-track border crossing. Bolivian-US relations are not good, so we have to pay a hefty $135 entrance fee (other countries don’t have to pay anything), but I wasn’t too worried about this border because from everything we had read, it is easy. We found were all the locals buy their awesome hats! Unfortunately they were closing, so we couldn’t purchase any. Going through Peru immigration was easy. We changed the rest of our Peruvian Soles to Bolivianos and walked 200 meters to the Bolivian immigration office. We were told by the first officer that we had to apply for a visa. No problem, we were expecting this. Filled out our paperwork, Matt had to run to make a copy of his passport, got out our cash, and thought the rest should be easy. Surprise! The visa officer was completely plastered at 5PM. I handed the visa officer my paperwork, passport, and finally $140. Each time he started to count the money, he would drop the entire stack on the desk and have to start over. He finally gave up on that and counted the money by pushing the twenties from one end of the desk to the other. I had trouble understanding his slurred speech (as did everyone else in the room). Five minutes later, he gave a grunt and carelessly dropped the money into a drawer. He handed me incorrect change ($5 more than he should have). The next 10 minutes was him flipping through my passport frantically. Was he waiting for a bribe? But I had just handed him USD and he gave me extra change?! I was trying to stay calm but very aware that the border closed in 30 minutes. At this point, our bus was honking impatiently so Matt went to see if the driver could help us through this situation. Matt grabbed our bags off the bus, yelled some choice words, and the bus left us on the Bolivian border. 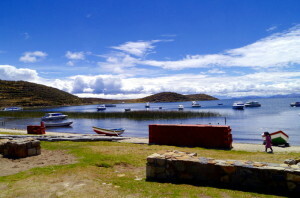 We do NOT recommend Titicaca Buses – they cram you into the seats like sardines and have no issue dumping you at the border, even in the evening. Meanwhile, the visa officer continued to flip through my passport – he insisted that I was missing my Peruvian exit stamp. I must have pointed out my exit stamp to him 10 times, but each time he just blinked several times and stared blankly. Dissatisfied, he kept flipping through my passport until finally the first immigration officer came over to see what the issue was. Fortunately, the first immigration was incredibly nice (and sober!!!) and ended up helping us through the process. The first officer was incredibly nice and patient with his drunk colleague. Is this standard? I guess it was Thursday? 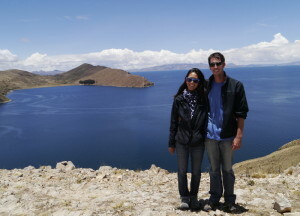 Twenty-five minutes later, Matt and I were officially in Bolivia! Fortunately for us, Copacabana is a close 8km from the border so we took a collective (shared taxi) into town. We arrived late evening and were treated to some amazing street food. Fried trout and we finally tried cow hearts for the first time! Just like everyone had said, cow hearts are surprisingly good. It was salty and chewy/tender at the same time. We wish we had tried this delicacy much earlier (as it is popular in Peru). The next morning, it was a calm 2 hour boat ride on Lake Titicaca to Isla del Sol. We got off the boat in the northern part of the island, hiked around to see the Incan ruins, and continued hiking 4 miles along the ridge to the southern end. The views were absolutely spectacular – far exceeding what I had imagined. 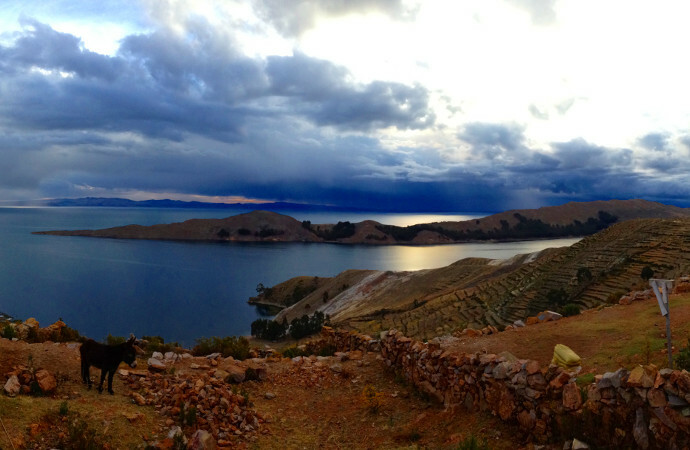 The Incas believed Isla del Sol to be the birthplace of the sun, which from the views we could see why. We stopped for lunch at the highest point in our hike. There were 360 degrees of rainstorms/clouds along the mainland but a clear sunny skies above the island. 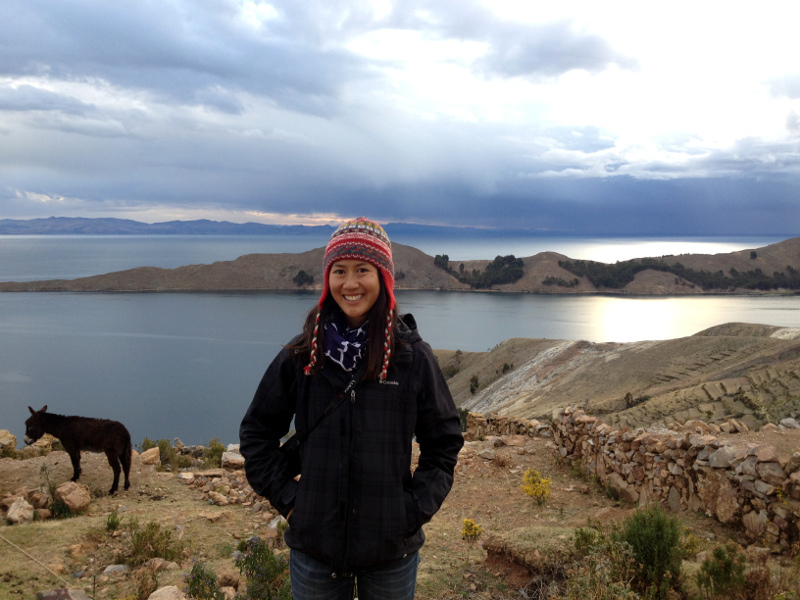 Gorgeous, gorgeous scenery – this was the Lake Titicaca I was excited to see! 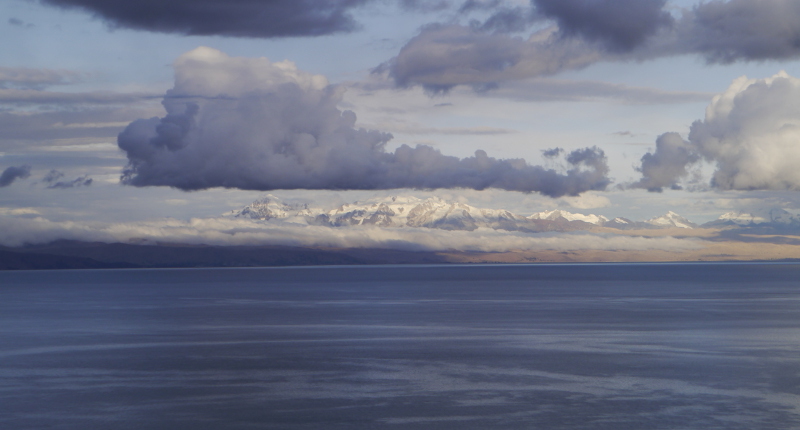 On the southern end of the island, we were greeted by the sight of glaciers in the distance. It was absolutely stunning – my camera was completely inadequately captures this sight. We enjoyed a relaxing view of the sunset at dinner and woke up to the same glaciers in the sunrise. The hostel that we stayed at was owned by an incredibly lovely elderly couple. I was surprised by the amount of trust – by the time Matt and I got back from breakfast, the couple had gone out for the day. They knew we were leaving, so they just left a little note for us. We hiked back up to the northern part of the island through the coastal path, which passes through where many people live, to catch our boat back. Our return boat stopped for a few minutes at a floating island before arriving back to the mainland. 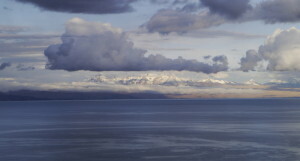 There are several floating islands in Lake Titicaca, each constructed of reeds. It felt a bit like walking on a waterbed. Back on shore, we were greeted by a parade of cars that had just been blessed. 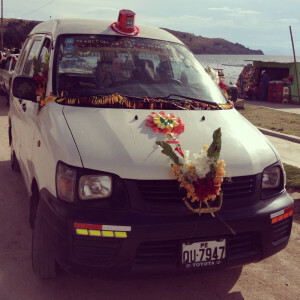 It is a tradition to get your car blessed at the church on the top of the hill for good luck – it is then adorned in fresh flowers and we even saw a car sporting a hat! We watched the weekend festivities while enjoying a beer – rented motorcycles being raced up and down the strand, people rolling around in the water in those gigantic inflatable hamster balls – this is what Saturdays in Copacabana are about!